It started on 15th August 2010 when I joined Morgan Stanley after campus. I wasn’t very new to Mumbai. 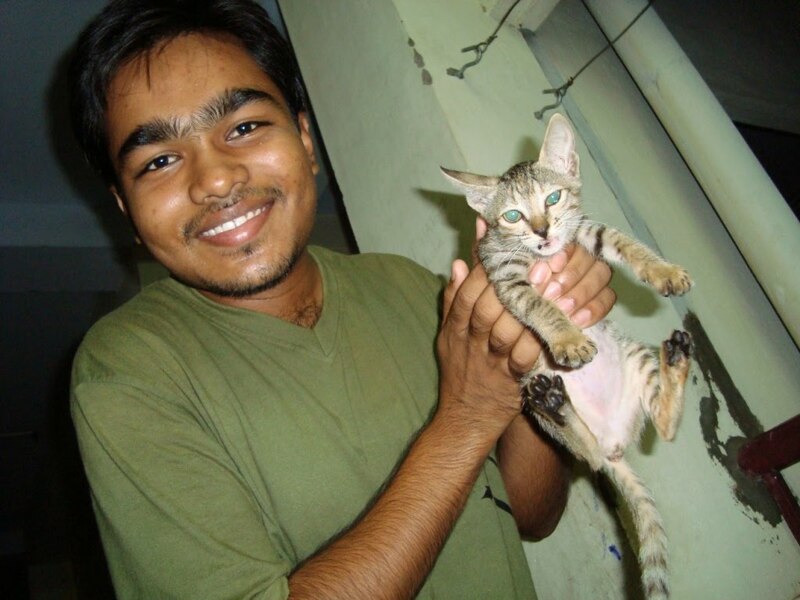 I had done my internships in IIT Bombay. So I was pretty much acquainted with the skills you need to travel in the local trains. The first two things I noticed were the traffic and the rains. So much has already been said about the Mumbai rains. And yes, they stood true to their reputation. 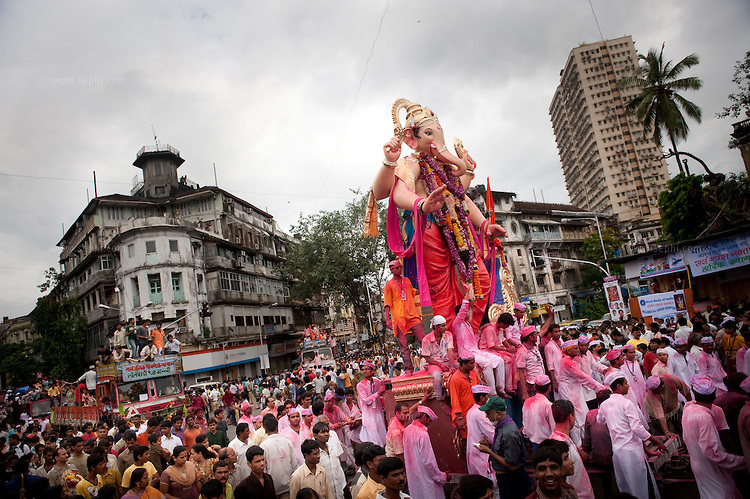 Next in line was the cultural shock when we started going around seeing Mumbai. Rarely did we visit any of typical tourist destinations like Ajanta caves, Gateway of India et al. Our hangouts were places like Juhu Beach, Carter Road, Marine Drive, Lokhandwala and the numerous restaurants and pubs in Mumbai. I think you can spend a lifetime and a fortune if you want to cover all the hangout places in Mumbai. You wouldn’t want to go out to these places in the day, the traffic won’t let you reach there and it is too hot and humid to actually enjoy being out. After 9 is when the nightlife starts. 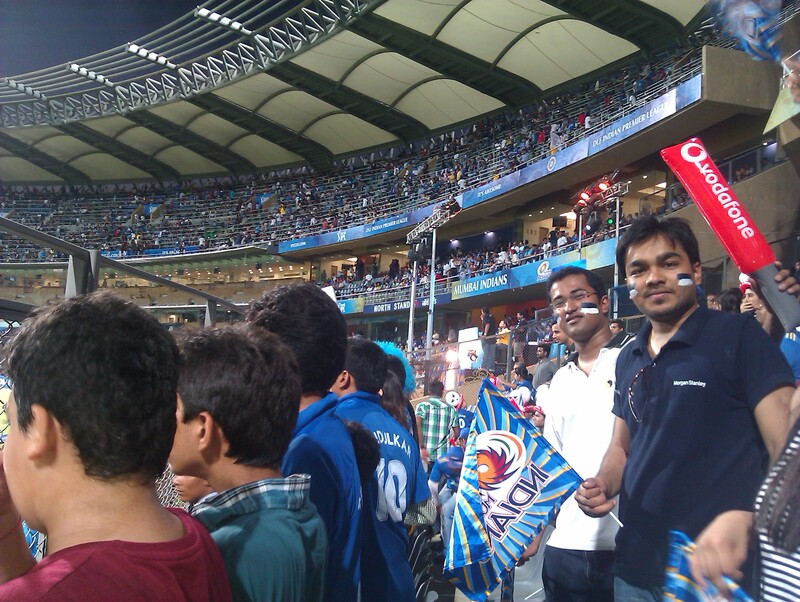 What was more shocking for me was amount of money people have/spend in Mumbai. All the expensive and imported cars, bikes, houses; ridiculously expensive brands actually selling their stuff makes you think that wealth is really distributed every unevenly in our country; it is certainly concentrated in some pockets. You would need to be earning ridiculous amounts of money to be able to afford a house in a decent locality. Sure you can get good and affordable food in Mumbai, but if you want to buy a house, settle down and have a decent standard of living you’d need to earn/inherit a fortune. 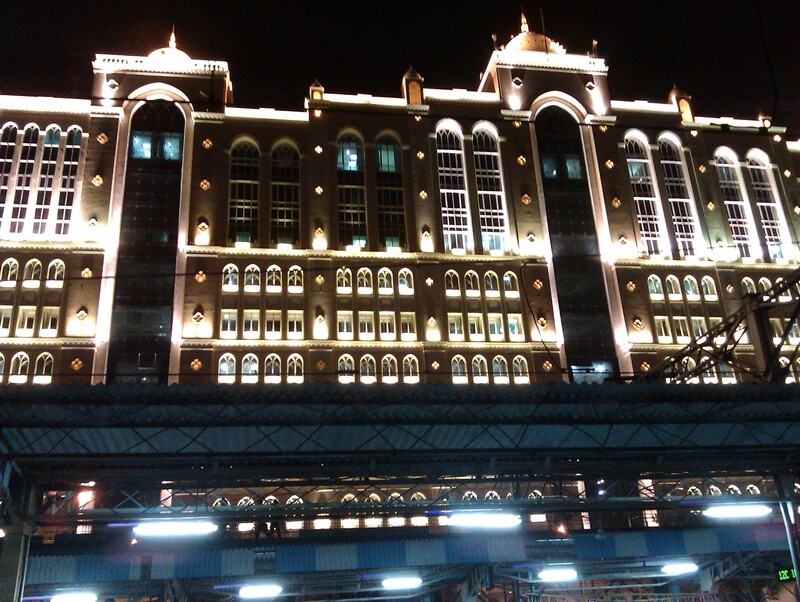 Saifee Hospital beautifully lit in the night. The city is full of surprises, specially for someone who has spent four years of his college life in Trichy. Ever thought people hanging out with their kids at the Swings and people showing off their expensive cars and bikes till 1-2 AM and awesome eateries ranging from cafe to yogurt to Mughlai cuisine in the same place? Carter road happens to be just the place! Ever imagined an eating joint with 99 varieties of Dosa? See it in Malad. Ever imagined auto-rickshaws actually charging according to the meter! I think the autos in Mumbai are the most economical amongst the tier 1 and 2 cities. Ever imagined people in the most expensive of cars line up for kebabs from a street side eatery till 4 in the morning? Bade Miyan at Colaba is where you need to go. The place opens up at 7 PM. Ever imagined a class Sea bridge in India? Bandra-Worli Sea link is certainly class! Ever imagined a tiffin distribution company with an error margin of 1 in 1 Million running without any sophisticated IT system? We present to you The Dabbawalas. Ever Imagined a city were people celebrated almost all of the major festivals ,even the regional ones, with unfathomable fervor and joy? Be it Ganesh Chaturthi, Eid, Durga Puja, Navratri, Holi, Diwali, Pongal, Chirstmas? You name it, they celebrate it! Ever thought of a local train network with a train in every 3 minutes? The local trains are the lifeline of Mumbai. Ever imagined an international airport and Asia’s biggest slum (nothing to be proud of) to be adjacent to each other? 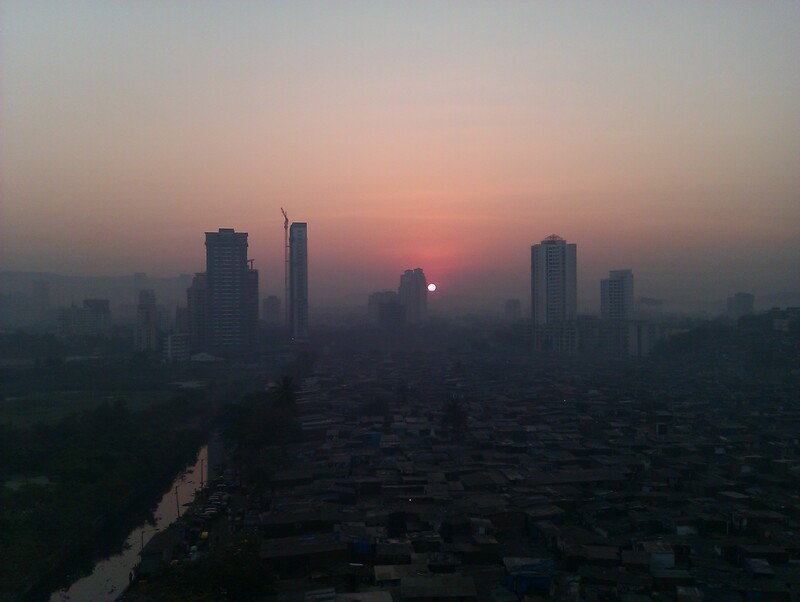 Dharavi happens to be the place. 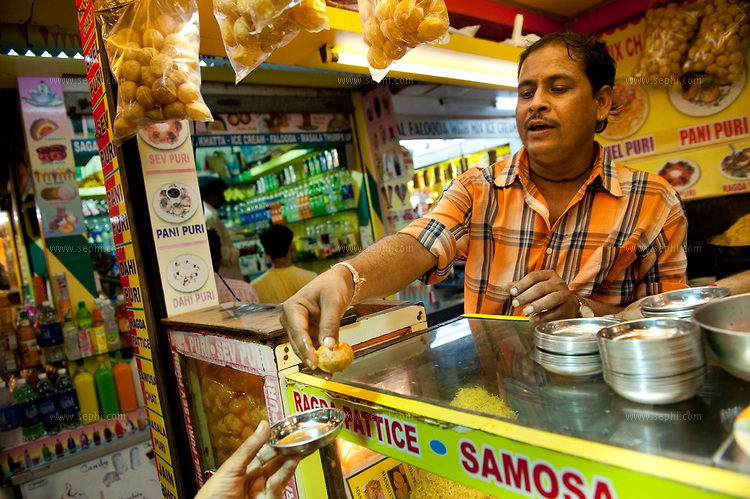 Ever imagined people lining up to half a kilometer just to eat pav bhaji at a particular joint? You’ve got to see Sardar Pav Bhaji! You can get anything to eat round the clock in this place! You just got to know the spots! 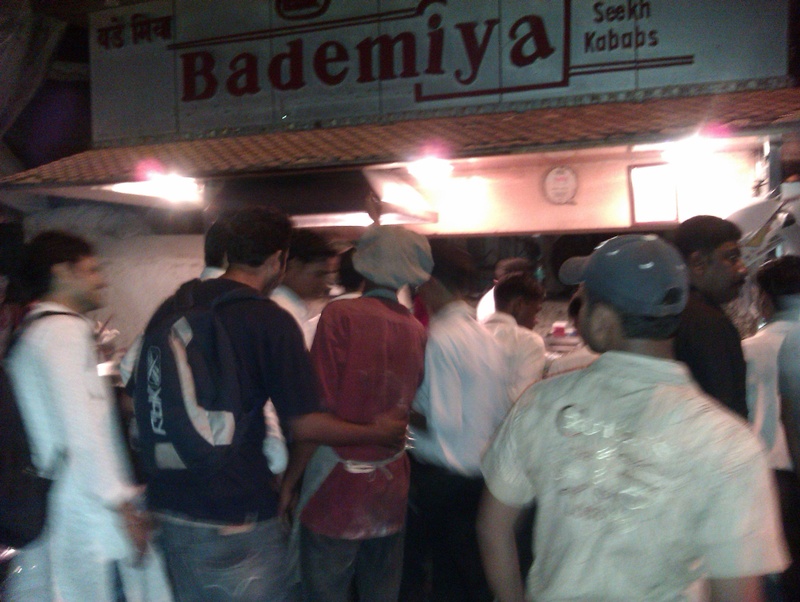 Bade Miya : THE street side kebab joint which opens from 7 PM till 4 AM and makes people go crazy for its kebabs. One of the many things I like about Mumbai is the police is pretty accommodation for the nightlife, but maintains pretty awesome security in the city. Sure there are some instances you’d hear about sometimes, but compared to other cities it is still much better. More on that later. 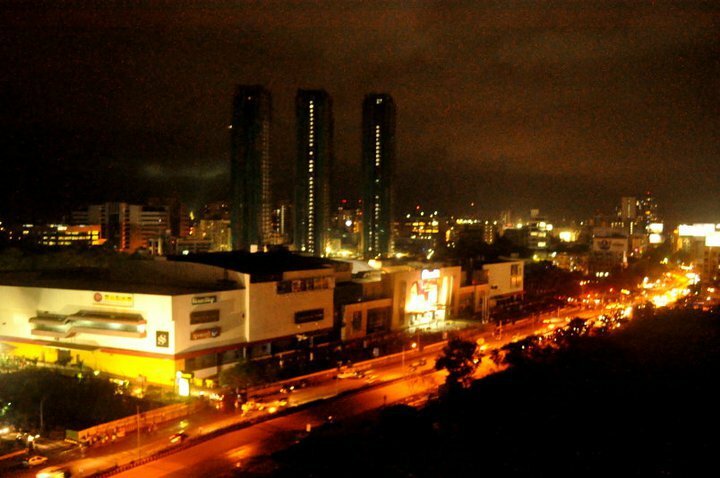 A view of Inorbit mall from my place in Mumbai. expensive hotels and houses, the awesome street food joints to the most happening discos and pubs, the soothing and happening sea sides to beautiful hill stations around the city, the friendly neighbourhood shops to the most happening malls, the financial industry to Bollywood; the list can go on. 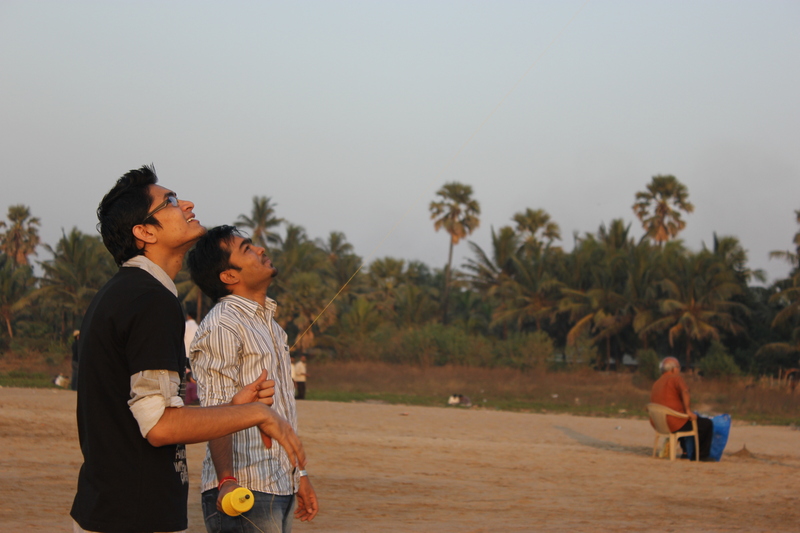 Makar Sankranti at Aksa Beach. I guess as with anyone who has spent substantial amount of time in Mumbai I too am in Love with the city, more so because of the awesome friends I have there. 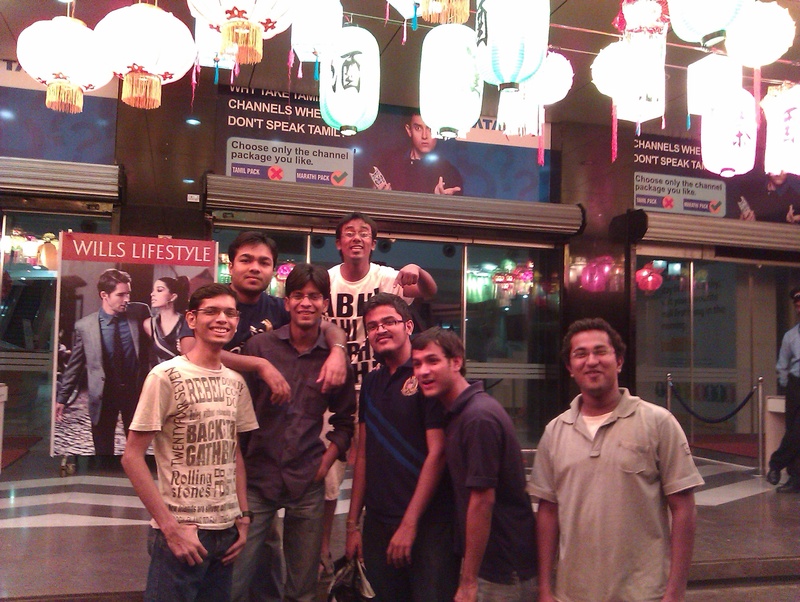 Even after moving to Bangalore, I love it when I get to travel there and hangout with the friends. Restoring all your contacts and calendar birthday/anniversary entries after losing your cellphone or complete phonebook is such a pain in the neck. Who would not want to save himself from the pain of messaging the sender of every SMS you receive saying “May i know who is this? I lost my cellphone/I lost all my contacts?”. If your phone is hi-fi ( read supported by PC Suite Softwares ), then you may back up your phonebook through it. But what if your phone is one of the ‘sasta, sundar, tikau’ (inexpensive, beautiful and durable) Nokia phones (or any other brand for that matter), like mine. Here is an easy method to back up your phonebook even from models not supported by PC Suite Softwares. Gnokii has options for managing various features of your phone. Here only backing up and restoring contacts and calendar are described. The list of supported cellphone models and the corresponding datacable models can be found here. All you need is a data cable for your phone, Linux Operating system (I have given commands for Ubuntu and Fedora here, others are similar). If you don’t have Gnokii Installed, you will need an internet connection. Now copy the sample configuration file ‘/etc/gnokiirc’ to your home folder as ‘.gnokiirc’. Open the file in gedit or vim and change the value of the three variables (port, model and connection) in the [global] section of the .gnokiirc file. For my phone (Nokia 2626) these settings worked. You can check out the settings for your phone model here. P.S. : This does not delete any contact from your phone. To Restore your contacts back to the phone from the VCARD file. The poem is not completely original. Don’t know who was the Original Author of this peom. First half of the poem is taken from the original one, while the second half more or less describes my experience at NIT Trichy. Enjoy! The cat named Jenny by the archi guys of my batch (though I’m sure she doesn’t have a clue of it :P) gave birth to 3 kittens in my neighbouring room on 21st July.. Though there were a whole lot of blame games after it, as to who the father is?? :P. It was during these games that the wing thought of naming the kids as Alpha Bali, Beta Bali and Gamma Bali (due to reasons unexplainable here :P). Later we found that the one responsible for it was the cat Goldy who apparently lives in our hostel only (again named so by our hostel junta). 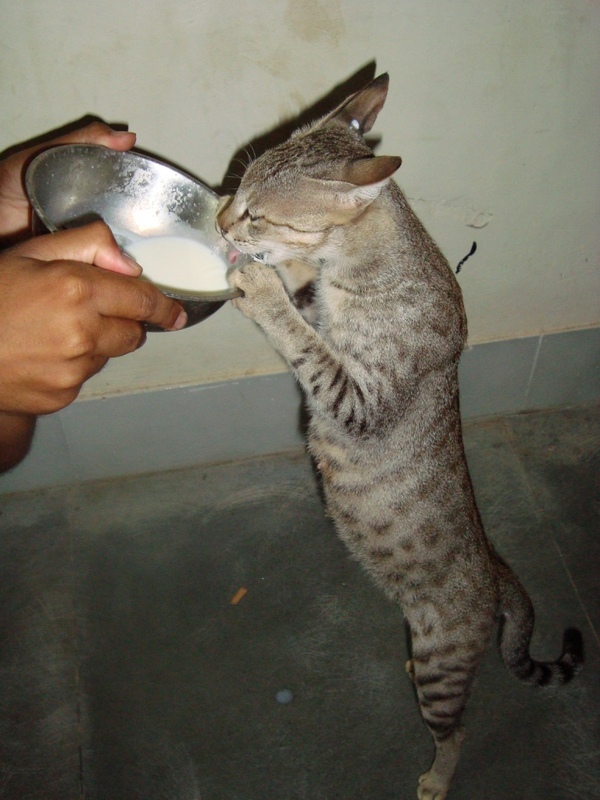 At once all the maternal love in our wing junta came into effect and they started feeding the cat on the milk they brought from the mess..
We now provide info to the campus junta directly onto their mobile phone.. like none other..
We’re planning to expand it to include nittmail notifications, octa print-out notifications, train inquiries , mass messaging and much more that makes it absolutely irresistible..
All you need to have is either an account on the spider website on the insti LAN or aditya LDAP account (the one which you use to login into octa computers)..
send an sms as “Register rollno aditya-password” to the spider phone . for eg if my rollno is 106106058 and password is helloworld then i need to send “Register 106106058 helloworld”. If your password is not correct then you will receive an sms stating the same, other wise you’ll receive an acknowledgment stating that you are registered for the sms service. 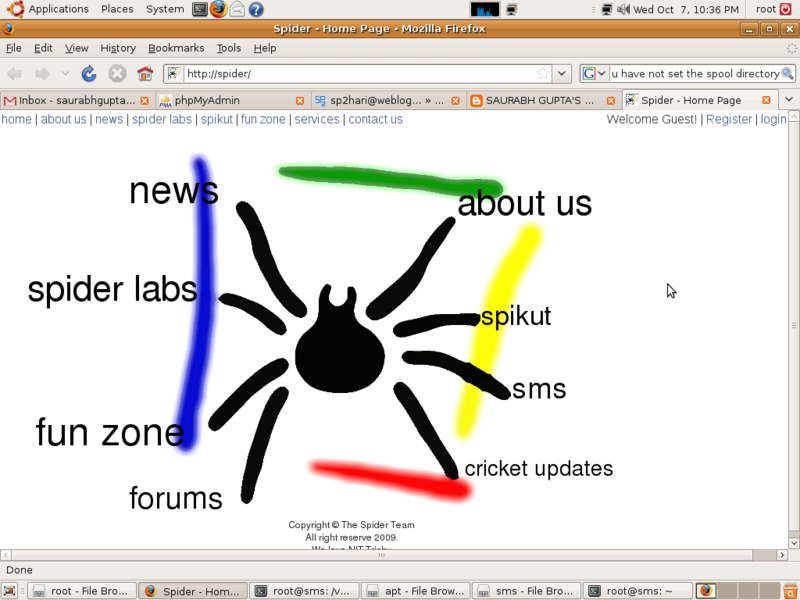 If you didn’t have a profile on the spider website, it will create one for you and you can login into the same through your aditya password, otherwise it’ll update the phone number on your profile. You’ll need to subscribe to the various services individually by sending an sms as Yes followed by a space followed by the keyword for the particular service. for e.g. to subscribe for scores send ‘”yes score” to spider phone. You can find the full list of the services and their keywords on http://spider.nitt.edu/sms (accessible only on insti LAN). Now coming to the technical aspect. We use a nokia 6030 phone and interface it with a computer (sms gateway) running Linux through gnokii. gnokii-smsd is a daemon used to send and receive messages from and to a mysql database. (Installation details are best explained here ) . Hari had started this service with some features but he wrote the code in c, and we couldn’t expand it to include new services. So we developed it in php, starting from scratch. We have a shell scripts which fetch the content (as rss feeds) from the internet at desired intervals (through cron). PHP scripts parse those rss feeds and dump the headlines into files, compresses the content so as to fit maximum of it into a single message, send this content to the subscribes users. Another php script which runs permanently, processes the incoming messages and maintains the user accounts and subscriptions. It was such a fun working with surath, hajela and vivek in spider lab.